Why are some ethnic groups favored over others? Kurds in Iraq are getting ready to hold a referendum on becoming more autonomous. In Turkey some of them, at least, have been fighting for independence for decades. In Syria Kurds were the key to the resistance to the Islamic State caliphate. They also occupy part of north-western Iran. In some nations they are more discriminated against than others. They seem to have done reasonably well in Syria and Iran. Turkey, both the old Ottoman Turkey and the modern (until recently) secular state, did its best to crush them and try to make them into Turkish speakers. In Iraq they were repressed by Saddam Hussein, and are not all that happy to be ruled by the Arab tribes to the south. The four areas listed above are adjacent. Put them together and they would form a contiguous state. It would be a Kurd majority state; other ethnic groups in the region would become minorities. The total number of Kurds is estimated at 36 to 46 million. Many nation states have smaller populations. The total population of Syria, for instance, has about $17 million people. I have not seen a poll, but it appears most Kurds would like to form a nation, Kurdistan. The history of people getting, or not getting, their own nation is a complex one. World War I era President Woodrow Wilson, for all his faults, stated the Principle of National Self-Determination. This came up in the jockeying after World War I, when the Austrian and Ottoman empires came to an end. Many new nations were created according to this principle: Greece, Poland, Austria, and Hungary, for instance. But neither Wilson nor his imperialist brothers in France and the British Empire had any desire to apply this idea consistently. Wilson famously spurned the Vietnamese request presented by Ho Chi Minh for independence. He refused independence to American colonies like Puerto Rico and the Philippines. And he was happy to have the French and Brits carve up the Middle East to their own satisfaction. And so the core Turkish part of the old Ottoman Empire ended up including part of Kurdistan. The borders of Syria, Iraq, Jordan and Palestine were drawn by Europeans. It was not just that the Brits laid down the lines without regard to ethnic groups. They wanted a mix of groups in each state because they had learned, in India and elsewhere, that extracting wealth required the least number of troops and police when you can play off ethnic groups against each other. Kurds speak Kurdish, though most are bilingual. Kurds hold to a variety of religions, but a majority are Sunni Islam. There are Shia Kurds, a couple of hundred thousand Jewish Kurds, and a variety of smaller groups, including Christians and atheists. One of the arguments for the establishment of a Jewish homeland in Palestine was that Jews were discriminated against when they were minorities of other nations. Pakistan was created so that there could be an Islamic majority nation on the Indian subcontinent. In the United States, we have granted even tiny Native American tribes a limited form of sovereignty over tribal lands. Iraq, Turkey, Syria and Iran are not likely to be happy neighbors. Russia and Saudi Arabia are likely to try to meddle. 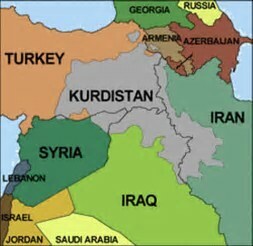 And Kurdistan would have no outlet to the sea, so it would be dependent on transporting goods through its neighbors. I see no reason why the United Nations should not just go ahead and help create Kurdistan. Set up a commission to make fair boundaries. Arm the Kurds to make sure it isn't worth an argument from Iran or Turkey, who are most in position to use military force to back up their self-serving objections. What Kurdistan is like will be up to its people. In the past a lot of the Kurdish armed resistance was Communist, but I don't think that is true any more. Even under a democracy there will be problems. Kurds are not that different from the rest of us humans.